So we have a reader question today…how to set up your Twitter profile with more of a marketing strategy and less of pop culture feel? This is a more advanced tutorial so I am not going to start with, go to Twitter.com and put in your name and email. I am assuming that you have an account and that you have verified your email address. First big question – should you change your twitter name or handle? We get this one a lot. If you have just set up your account, change away. If you picked an offensive name or one that will be shut down once you get successful, change away. BUT, if you have had it for any length of time and have followers, links from your website and other web properties, I would leave it alone and focus on what matters, a great profile and posting amazing content. ps – when I say one that will get shut down…for example the term “realtor” is trademarked by the National Association of Realtors, if you have a tiny account, they will leave you alone using it. The problem is that once you get successful, they will do a cease and desist, causing heartache and strife to your amazingly successful Twitter account. All the bits that you need to work on will be in the gear > settings. We will break down the simple, straight forward bits and then talk about strategy. Account: Has your user name, email and timezone…this is pretty straight forward. Mobile: I ignore this! I keep my phone separate from my social media. Profile: This is where you can really shine…we will cover it more in depth later. One thing NOT to do is to connect your Twitter to your Facebook. Choosing this will post your tweets on your FB and could make you look VERY spammy on FB. If you want connect your Facebook to your Twitter that is TOTALLY acceptable though www.facebook.com/twitter. Design: This is also a place to set yourself apart for people who see your profile on the internet. That said, with more people accessing your profile through apps it isn’t as vital as it once was. I DO recommend you make it less generic (I notice when people have the generic twitter background and think they are schmoes). If you want to see some fancy twitter backgrounds go ahead and check out the link. One reason I don’t have all my contact info on my background is that the links are not clickable so do not actually serve as a back link or a way to reach me, functionally, the background is just a giant picture. 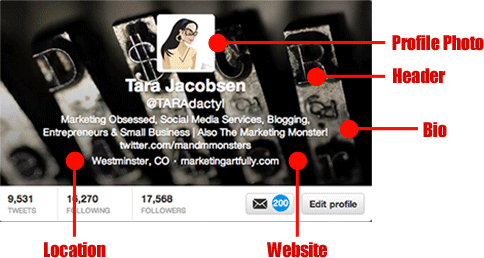 I use my profile area to generate backlinks. Apps: This is where you will see all the apps connected to your account. It is worth it from time to time to take a peek, but generally not an area of marketing focus. That said, I DO NOT RECOMMEND that you join a followback app or a “who unfriended me” app as these are thought of very unfavorably by real Twitter users. 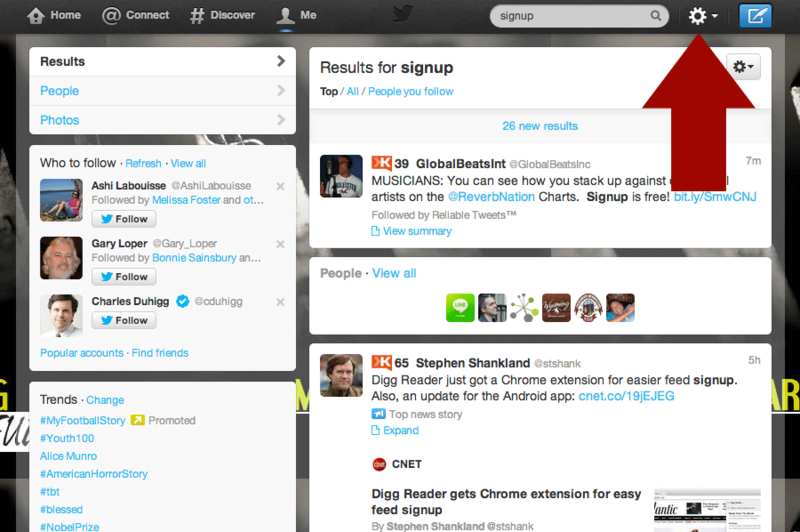 Widgets: These are used to put your twitter bits on your website. As my only goal for my website is to get people on my email list, I do not put a twitter feed that could distract them on my site. Profile Photo: This should be a picture of a human optimally, could be your logo but surprisingly enough people mostly like to connect and share with other humans. I have heard that “changing it up” helps keep things interesting. I feel like “changing up dilutes your brand and doesn’t give people a way to learn to know, like and trust you! Header: Not sure that this is that important other than making sure that it doesn’t compete with information and clickable links that sit on top of it. This could be something you change up, but I have so much more important uses of my time. Bio: The most important bit for marketing. You need to make sure you get your keywords into here. I had a client who was an author who named his book “marry yourself first”…this would not be great to have people find your profile and follow you. You would want to talk about “self help” or “personal development” instead. Also, please make sure to get your actual function into the bio. Use terms that describe your title, doctor, author, direct sales, realtor, etc. You can also make hyperlinks here BUT don’t overdo it. Keep it to one that really makes a difference. Location: While it is nice to have your actual town here, you may do better to get followers by choosing the biggest close location. Website: This one is easy peasy, put your primary website here. If you are linking to a sub page for capturing email addresses you will need to have a direct link to it. For example I don’t use a shortner to get people to a landing page on my website, I use a top level domain name www.100FreeMarketingIdeas.com. This is because people are sick of getting scammed on the internet and they want to be able to see where a link goes before they commit to spend their time checking it out. 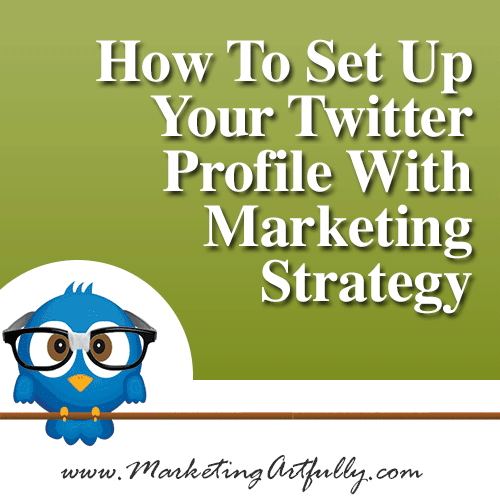 So there you have it…A LOT of information that will help with setting up your Twitter profile with marketing strategy and thought. If you have any further questions please leave a comment below and I will add it to the mix!